Grantline Dental extends a warm welcome from our family to yours! Everyone needs a competent and skilled dentist to maintain or achieve a beautiful, healthy smile. So if you are looking for a dentist who will listen to you and surpass your dental needs with his knowledge and skills then look no further! 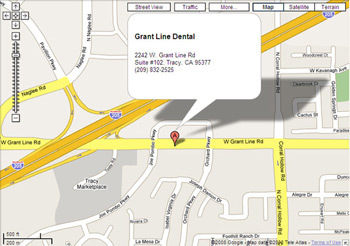 At Grantline Dental, Tracy CA we have a well appointed, high tech office with private and comfortable treatment rooms and an excellent and caring staff to meet your dental needs. Our patients always come first and we are proud to offer personalized and comfortable care in a relaxed atmosphere. Dr. Daman Gill is a passionate, driven and talented dentist who provides Family, Cosmetic, Dental Implant, Sedation, Laser Dentistry. According to the National Institute of Dental and Craniofacial Research (NIDCR), 80% of the U.S. population has some form of periodontal (gum) disease and many don't even know it. Dental decay and periodontal (gum) disease are the number one cause of tooth loss in children and adults respectively. During your appointment, we will take the time to know you personally, and will address the three ways people lose teeth: gum disease, bite issues, and decay. Our focus is on early diagnosis and prevention of tooth loss by the use of conservative dental treatment methods, helping you keep your teeth for a lifetime of beautiful smiles! Whether it is a routine cleaning, braces, implant or a complete smile makeover, feel confident that our patients feel Dr. Daman Gill offers the BEST Family and Cosmetic dentistry in Tracy, CA and is the right choice for you. Dr. Gill and his team will do everything possible to ensure you a pleasant visit! So come see us to achieve that smile of your dreams. Even if you are in the area, drop in for a meet & greet and ask us any dental questions you may have on your mind. Have a wonderful day and smile more often.